Twilight Terror is the fifth level of Bright Savannah in Donkey Kong Country: Tropical Freeze. It is a Rocket Barrel level that takes place above water, with Gargantuan Gills attacking from the background. It is also the only level in the game with two secret exits. Another cover of "Mine Menace" from Donkey Kong Country Returns, titled after the level's name, plays throughout the Rocket Barrel sequence, while a cover of "Stickerbrush Symphony" from Donkey Kong Country 2: Diddy's Kong Quest plays before and after it. At the start of the level, Donkey Kong will encounter a single Waldough, and a raft with a DK Barrel floating on the water. Once they start up the Rocket Barrel, the gate to the right will open. 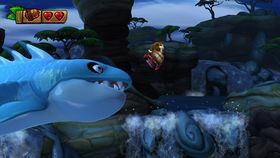 As the Kongs proceed through the first part of the level, a blue Gargantuan Gills will arrive from the background and act as an obstacle. Collectibles encased in bubbles will also appear from the water. The Kongs will also need to avoid sea stacks, and Green Finleys that leap out from the water. After reaching the first checkpoint, the Kongs will enter what appears to be a fishing ground for Tucks, where fishing nets carrying schools of fish are being raised and lowered and as a result get in the Rocket Barrel's way. As the Kongs make their way through, the Gargantuan Gills will reappear in the background and topple over some of the wooden fishing structures, creating more obstacles for them. After passing through a small shack, the Kongs will leave the fishing ground and find the next checkpoint. In the final part of the level, more Gargantuan Gills will appear from the background and swim towards the camera, including purple ones, which jump out from the water instead. Eventually, the Rocket Barrel will reach a waterfall and begin to sputter. A blue Gargantuan Gills will then leap towards the Kongs, but unsuccessfully catches them as they dismount the Rocket Barrel and dive into the water below. The Slot Machine Barrel is found on a raft on the water's surface. K: Among the last of the several columns of Bananas at the start of the Rocket Barrel sequence. O: Under an arching sea stack between the first two green Finleys. N: On top of the third small fishing net. G: Inside the third bubble after the second checkpoint. At the start of the level, if the Kongs dive into the water, they will find an entrance to a Bonus Area with the Puzzle Piece to the left. Revealed after collecting the line of Bananas with Banana Coins on both ends of it. Under an arching sea stack after the blue Gargantuan Gills swims just underneath the Rocket Barrel. On top of the first small fishing net. Inside a clam on the right wall underwater at the end of the level. Dixie Kong is required to access this secret exit. The portal leading to it is found at the bottom of the lake, where the blue Gargantuan Gills lies unconscious. Using Dixie's hair, the player must swim through the water current here to reach the portal, which leads to a small area with the Slot Machine Barrel. This secret exit leads to Rickety Rafters. Either Dixie Kong or Cranky Kong must be used to access this secret exit. The portal leading to it is be found above the entrance to the fishing shack. Once inside, the player must use Dixie's hover spin or Cranky's cane to reach the Slot Machine Barrel. This secret exit leads to Bramble Scramble. This page was last edited on April 15, 2019, at 12:30.